Jane is a Partner in the Private Capital team specialising in wills, trusts, estate planning, estate administrations and powers of attorney. Jane guides individuals and their families to develop solutions that meet their particular needs and requirements in a tax efficient way and to protect their hard earned wealth across the generations, protecting assets where necessary. The needs of elderly clients and those who have concerns about capacity issues are addressed through powers of attorney and deputyships. 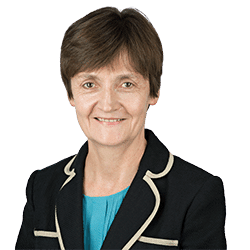 Jane also deals with the creation and administration of trusts as well as dealing with the winding up of complex and taxable estates. Jane joined Clarke Willmott in 2014 after 14 years in the Private Client Team of Gateley Birmingham. Working with Accountants and Financial Advisors to produce Estate Planning Solutions for those clients who have sold businesses and related generational planning. Deputyship applications and addressing the need for a statutory will. The Administration of estates subject to Inheritance Tax using Deeds of Variation where appropriate.